Why Study Odor Emissions from Animal Housing? To determine odor emission characteristics by using common protocols and standardized olfactometry, from four mechanically-ventilated National Air Emissions Monitoring Study (NAEMS) sites, two dairy and two swine. To develop a comprehensive chemical library that delineates the most significant odorants, and correlate this library with olfactometry results. To disseminate information to stakeholders including producers, agencies, regulators, researchers, local government officials, consultants, and neighbors of animal operations. Data is being collected from the four NAEMS sites (dairy sites in Wisconsin and Indiana and pig sites in Iowa and Indiana). Data collection is about ¼ completed (first 13 week cycle completed in April, 2008 and second cycle started in May, 2008) Raw data compilation in a U of MN website based spreadsheets for this first round is nearly completed. Olfactometry data is being done at the U of MN, Iowa State, and Purdue labs while GC-MS data is analyzed at West Texas State University and GC-MS-O data is processed at Iowa State University. Sorbent tubes for both GC-MS data and GC-MS-O data have been successfully used to trap VOC in the emissions streams from the four barns without “breakouts” occurring. Approximately 15 to 20 compounds are being identified and with airflow data, actual emission data of these compounds should be able to be calculated. This study is supplementing the National Air Emissions Monitoring Study (NAEMS) with comprehensive measurements of odor emissions. 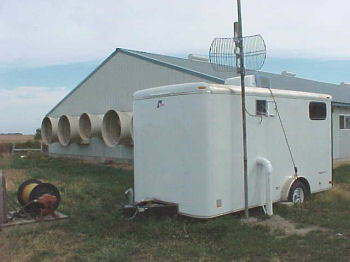 The NAEMS will help livestock and poultry producers comply with EPA regulations concerning regulated gases and particulate matter by monitoring these pollutants continuously for 24 months, in order to determine which types of farms are likely to emit threshold levels of contaminants under the current regulations. Although odor plagues the animal industry with the greatest overall challenge, it is not included in the NAEMS, because the EPA does not regulate it and therefore did not include it in the Air Consent Agreement. This project adds odor emission measurements at four NAEMS sites during 12 months of the study. Both standard human sensory measurements (using dynamic forced-choice olfactometry), and a novel chemical analysis technique (GC-MS-O) for odorous compounds found in these emissions is being done in this study. The sensory and chemical methods would be correlated to gain both quantitative and qualitative understanding of odor emissions from animal buildings. Contact Larry D Jacobson, University of Minnesota, BBE Department, 1390 Eckles Ave, St. Paul, MN 55108. email: jacob007@umn.edu or phone 612-625-8288.